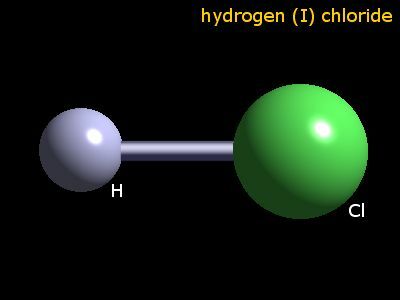 The oxidation number of hydrogen in hydrogen chloride is 1. Hydrogen chloride gas may be made in the laboratory by the reaction of concentrated sulphuric acid upon sodium chloride or by the by the reaction of concentrated sulphuric acid upon concentrated hydrochloric acid. In the latter case this involves adding hydrochloric acid to sulphuric acid and collecting the evolved hydrogen chloride gas. The yield is around 80%. The first of these routes is used in industry, where temperatures of about 150°C are used. Crude hydrogen chloride gas is an important byproduct of the organic chemicals industries. The table shows element percentages for HCl (hydrogen chloride). The chart below shows the calculated isotope pattern for the formula HCl with the most intense ion set to 100%.